In many instances, finding the right piece of decorative hardware is about having options. That means different handles available in different finishes and a variety of sizes. And whether you’re looking to outfit a simple piece of furniture or an entire house or building, Häfele America Co., one of America’s leading suppliers of decorative hardware and furniture hardware components, has the options you’re looking for at this year’s AWFS Fair. From traditional to contemporary, transitional and everything in between, Häfele’s offering of decorative hardware is stronger than it’s ever been for the furniture, millwork and design markets. Contemporary decorative hardware on display during this year’s show includes the Studio, Cosmopolitan, Nouveau, Veranda and Vogue collections. Transitional styles strike a chord with the Beaulieu, Georgia, Mulberry and Paragon collections. Those seeking more traditional hardware should seek out the all-new Keystone collection which spans from traditional to transitional. All collections feature matching pulls, handles and knobs in a variety of available finishes including sought after choices such as brushed brass, polished nickel and oil-rubbed bronze. 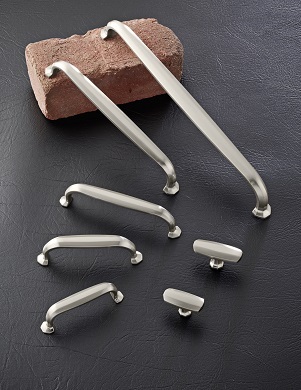 Rounding out the display is an array of grade 304 stainless steel handles offered in a contemporary style. Also being featured at AWFS 2017 are three all-new collections of corbels, cabinet and vanity posts and furniture feet—the traditional LaFayette, the transitional Hannover and the contemporary Prairie. Available in maple, cherry and special order oak wood species, each style builds on Häfele’s current collections and brings new opportunity and design possibilities to the industry.